Ice climber scales frozen Niagara Falls Jump to media player A Canadian ice climber stuns visitors to Niagara Falls by climbing up a frozen section of the famous gorge. Cascades of ice as Niagara freezes Jump to media player Plummeting temperatures in the Unites States and Canada have caused chaos for many but have created a spectacular sight at Niagara Falls. Niagara Falls crossed on tightrope Jump to media player Nik Wallenda, the seventh generation of a famed daredevil family, has successfully completed his attempt to tightrope walk across Niagara Falls. Man survives fall into Niagara Falls Jump to media player A man has survived a fall of more than 50 metres into the raging waters of Niagara Falls. 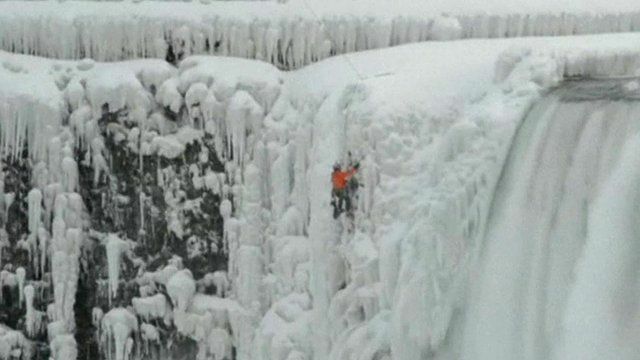 A Canadian ice climber has stunned visitors to Niagara Falls by climbing up a frozen section of the famous gorge. Will Gadd, 47, climbed next to the Horseshoe Falls, on the US side of the border.